This is a nice looking three year old Listed race over nine furlongs, with some decent looking prospects taking each other on. Ryan Moore rides Salouen, the current favourite, for the first time. This Canford Cliffs colt was placed in a couple of Group 1's as a two year old, and looks sure to be popular here today. Moore has been among the winners at the start of this season, with 13 winners (30.23%) from 43 runners for a level stakes profit of 9.70 points. John Gosden, who runs Khalidi here, has an excellent long term record at Newmarket. Over the past five years he's had 97 winners (19.32%) from 502 runners, for a level stakes profit of 46.45, therefore his runners here are always worth a second look. The Shortlist is the report that is free to all users on a Tuesday, and Montataire shows up really well, with four sections of green and a score of 12. He hasn't raced over this distance before, however the way he has shaped over a mile, together with his breeding, suggests that nine furlongs shouldn't be a problem and I expect him to go well. 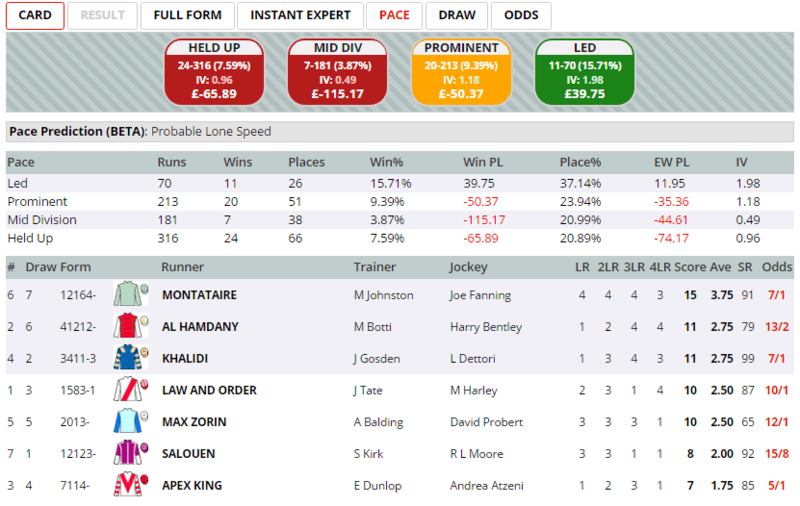 Law And Order is one of three runners that have two sections of green on the Instant Expert report, and he won a Listed race on the all weather at Lingfield over a mile recently. He does have to saddle a three pound penalty as a result of that win, so will probably need to improve again to take this. His race fitness will be guaranteed however, and he looks certain to appreciate the extra furlong here. Leaders here over this distance have a very good record, with nearly 16% of them going on to win the race, for a level stakes profit of 39.75. Montataire is a confirmed front runner, and has easily the highest pace score in this field. I expect Joe Fanning to try and fly out of the stall and dictate the pace of the race, before trying to nick the race from a couple of furlongs out. They will be lining up behind to take a shot at him, but it wouldn't surprise me if he was able to hang on and win the race, at quite a nice price. These are just some of the tools available for all UK and Irish races daily to Gold subscribers. To find out more, and take a test drive, click here. If you feel that any of your friends or colleagues would benefit from the above as an introduction to the Geegeez Gold tools, please go ahead and share this post on Twitter and Facebook.